Lauren Winfield struck a brilliant 74 before some exceptional work in the field helped England Women complete a series whitewash against South Africa. 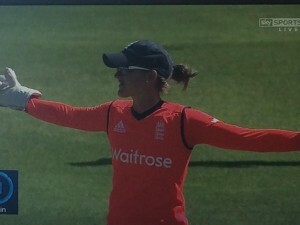 Winfield hit nine fours and the series’ first six before falling to Chloe Tryon as England posted 126 for six in the third and final NatWest International T20 at Edgbaston. And despite a good start from South Africa openers Dane van Niekerk and Trisha Chetty, superb fielding from Lydia Greenway, Natalie Sciver and Sarah Taylor ensured the tourists came up eight runs short in their chase. Winfield’s knock lasted 60 deliveries and her runs accounted for more than half of England’s total. Greenway, with 19 not out, was the only other home player to reach double figures as the hosts secured a clean sweep in the three-match series following victories at the Essex County Ground and Wantage Road. But England’s total was more than the tourists had managed so far in the tour and, despite posting three figures for the first time, they were unable to record their first win over England in a T20. It could have been different had England’s fielding not been on song. After van Niekerk was caught short of the crease by some quick thinking from Winfield – ending an opening stand of 59 – South Africa went on to lose two more wickets through run-outs, one from a brilliant stumping from Taylor and a terrific catch by Greenway. Greenway started it off in the 16th over, sliding well to stop Chetty’s shot reaching the boundary before flicking the ball to Sciver, whose direct-hit from the rope sent the South African opener on her way. The next ball, Mignon du Preez pulled towards the deep square-leg boundary but Greenway was well placed to take a leaping catch above her head. In the next over, Tryon set off for a quick single but Greenway’s throw was athletically taken behind the stumps by Taylor, who then flicked the bails off before Marizanne Kapp could make her ground. Tryon and Bernadine Bezuidenhout put on a quickfire 25 to take South Africa within sight of a historic victory, but the latter – batting out of her crease – played and missed against Katherine Brunt and Taylor pounced again with a stumping. The tourists needed 13 from the final over, but Jenny Gunn provided six impressive deliveries that yielded just four singles and secured England a 3-0 success.